A star-studded songfest. And if you're not careful, you might just learn something. If there’s two things I love, it’s a good parody song and a celebrity guest appearance. And if there are three things I love, the last one would have to be Muppets. On May 1, 2012, Warner Home Video and Sesame Workshop bring these loves together like chocolate and peanut butter and… well, I guess honey or something equally sweet like that. No, it isn’t a lost recording of Weird Al Yankovic on Fantasy Island; it’s Singing with the Stars, a celebrity-filled songfest featuring musical numbers from the past decade or so of Sesame Street. R.E.M., Feist, Alicia Keys, Jason Mraz, and LL Cool J are but a few of the stars who grace this nearly hour-long disc. Featuring Will.i.am’s Emmy Award-winning “What I Am”, Adam Sandler’s insanely catchy “Song about Elmo” and a side-splittingly funny performance from Ricky Gervais, Singing with the Stars is sure to capture the hearts of both parents and children and likely won’t leave the DVD player for a long time to come. Looking for something to keep the kids quiet on a long car ride that won’t drive you absolutely batty? Do you want a DVD that will get your kids off the couch and on to the dance floor (or even just the kitchen floor)? Are you interested in entertaining both your kids and yourself without sacrificing education? You’ve come to the right place, as Singing with the Stars covers all the bases. While peanut butter, chocolate ,and honey sound like a wonderful combination, what if a gooey, nougat-filled center was introduced into the mix? What if we extended my list of loves to four? What if this DVD was not only entertaining and educational, but also empowering? Guess what - it is! Many of the segments focus on encouraging kids to feel good about who they are, just the way they are. Self-esteem and confidence are the order of the day and even if you don’t believe in yourself, a quick pep talk (or song) from a furry monster is a quick way to make every day a great one. And it actually gets better. 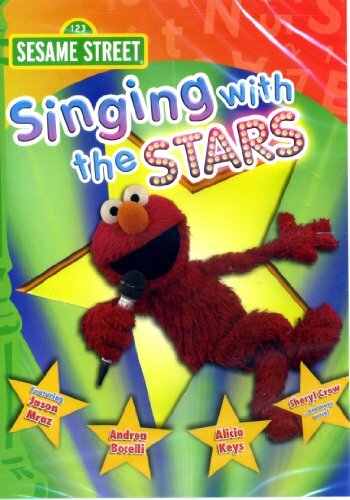 There’s a karaoke version included that allows kids and parents to sing along with all of the songs, as well as a downloadable activity book and musical activity tips for parents. I’ve always enjoyed Sesame Street’s DVD releases, but I was even more impressed with this one because it encourages parents to interact with their kids and offers the means to accomplish it. I’ll never doubt the ability of this program to be equally informative and entertaining, but I really appreciate the fact that they’re going above and beyond with this one. It’s one thing to put your kids in front of a television; it’s another thing entirely to sit down with them and discuss what they’ve seen. Kudos to Sesame Workshop for recognizing this and including this workbook and offering help to parents. Oh yeah, and there’s a five-song CD too, featuring traditional children’s songs like “The Wheels on the Bus” and “If You’re Happy And You Know It”. Even if you just use the CD as a coaster, you’re getting a lot of bang for your buck with this DVD. I’ve got two children under the age of five and a shelf full of Sesame Street DVDs. I’ve seen the vast majority of releases from Sesame Workshop over the past few years and I can honestly say that this one ranks among my favorites and my kids feel the same way. And if all that doesn’t convince you, let me put it this way - if you told me you were going to show me a DVD with performances by Hootie and the Blowfish, Jason Mraz, and the Goo Goo Dolls and that I’d actually enjoy it, I’d call you a liar (as well as a few other choice names) and kindly suggest you leave my home, never to return. But the fact is that yes, I did enjoy this DVD quite thoroughly and in fact, I’ll be watching it again later tonight. I might even let my kids watch it too.